Since I got into Retro Gaming I have played a lot of games that I missed the first time around. This is one of them. I am glad! I wouldn’t have liked it in 1993. I didn’t like “Heavy Metal”, I also couldn’t play racing games to save my life. So I am glad I am looking at it for what it is, not what it was. Normally, with a racing game, I would talk about the racing first. Not here. The title is “Rock ‘n’ Roll Racing”, so I’ll talk about the rock and roll first. And you know what? The soundtrack is AMAZING. You get 16bit renditions of some classic songs, the “Rock ‘n’ Roll” is a little tenuous, but my god it is awesome. 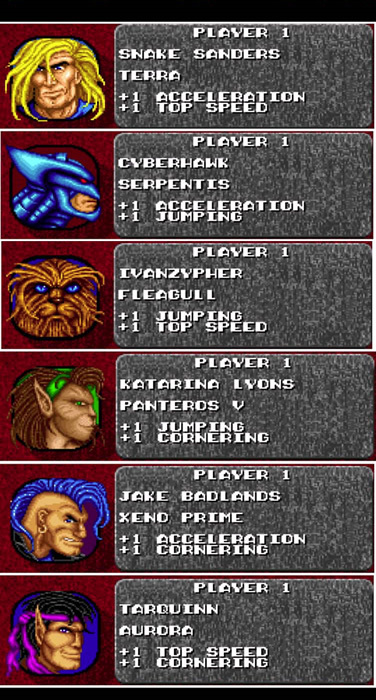 On the SNES version you get the following 5 songs. 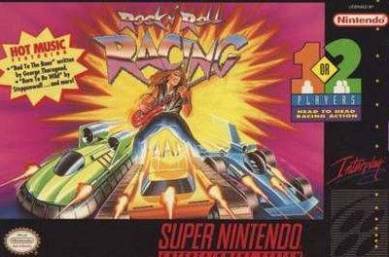 As far as I can tell, Bad to the Bone only plays on the title screen, I played for 3-4 hours straight and can’t remember it playing during a race. These are genuinely brilliant renditions of famous songs, and I highly recommend you give them a listen. It also puts later games like Crazy Taxi to shame by squeezing in the same amount of songs on a SNES cartridge. Rock ‘n’ Roll Racing is difficult to pigeon hole. It isn’t really like any other racing games. 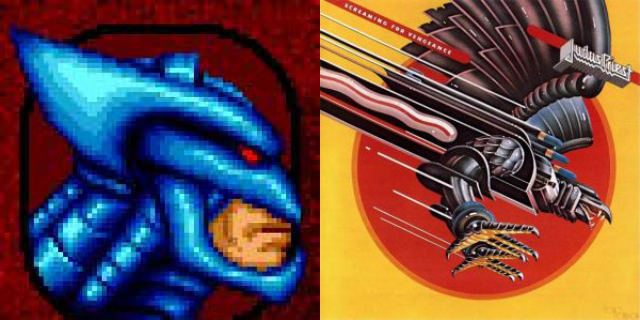 It isn’t attempting realism, or sticking a famous name/license to it, so as a result, it is sometimes compared to Micro Machines, but the two are totally different. RnRR plays in an isometric plane, allows for customisation, and adds a lot of RPG elements. At the start of each career, you choose which character you want. These all have their own stats, which do have an impact of the race. As you proceed can you purchase upgrades to weapons, boost, jump, and speed, from the money you earn from racing. Once you start racing, you race against 3 others in short 2-3 minute races, with points and money awarded for your finishing place. The point system is a nice feature, as you are set a specific number of points to qualify for the next season. So, if you win your first 5 matches, you can simply skip the last 5, and move onto the next planet/division. Which is handy, but also has downsides, as the money you will lose by not racing could put you at a disadvantage in the next league. RnRR handles pretty well, the cars start off a little sluggish, and skittish, but you’re against other sluggish/skittish cars, so it feels fair and balanced. As you progress, and get better, and so do the competitors, so again it feels fair, and there are no ridiculous difficulty spikes. You can however, run into trouble by skipping to many leagues. It isn’t always to your advantage to leave the first planet ASAP, sometimes, the best option is to stay in a league, and absolutely dominate it. Getting as much cash as possible, that way you can max out your upgrades earlier, and avert possible disaster at the hands of better equipped enemies. The track selection is a little limited for me. Each planet has it’s own tracks, so their is some variance, but if you choose to do all 20 races per planet you’ll visit the same tracks 5 times. Each planet has a different aesthetic, so each planet looks and feels different, but the tracks themselves offer little variation, except for being purple, instead of green. Two planets, the same track. RnRR is a tight little racing game, the single player is fairly substantive, and will take around 15 hours to fully complete it. The single player is great fun too, it does lack the 4 player option of Micro Machines, but the superior racing, and soundtrack make this a must. If you want track variety, choose Micro Machines, if you want depth, and fun… Stick with RnRR. Cons: …Music starts to grate, Limited tracks per planet, lots of repeating the same track. I loved this game. I was wondering why 80% then I looked at the pros and cons and I’d have to agree with you. I and my brother used to play this for hours upgrading our cars and teaming up against the computer. It is a great game. I actually preferred it to Micro Machines which I just couldn’t get into.